As a user of Avid’s (formerly Digidesign) 003 Rack FireWire audio interface, I know my days are numbered. While Avid still provides driver updates for the unit, they haven’t sold it since 2011 and they’ve announced that support will end on March 31, 2016. The 003 has worked well for me over the years. I don’t need a ton of I/Os as I use external preamps, I like having two headphone jacks as I’m usually recording with just one other person, and I use an Eleven Rack so I need S/PDIF inputs to embed guitar settings into Pro Tools. In my search for a replacement interface these are the basic things that I need. When Focusrite recently announced their new Saffire PRO 26, I wanted to see if it would make the short-list. According to Focusrite the Saffire PRO 26 is an 18-in, 8-out 24-bit/96kHz FireWire/Thunderbolt compatible interface designed with professional users in mind. Its four award-winning Focusrite preamps along with the very latest in A-D/D-A conversion technology combine with the powerful Saffire Mix Control software to deliver professional sound quality, flexible routing options and rock-solid reliability. I decided to use my MacBook Pro to test the Saffire PRO 26 as my main system is in the middle of a project. I’m glad I did because the unit is actually smaller than I thought it would be. This opens up a lot of possibilities in terms of being portable. The interface feels solid and I could easily place it into my backpack along with my laptop to do remote recording sessions. On the other side of that, it doesn’t appear to be rack mountable and may have to sit on the desk in my studio. Once you open the box, in addition to the interface, you’ll get a FireWire 400 to 800 cable, some paperwork, and a power supply. If you connect directly to the FireWire port as I did you won’t need the power supply as the Saffire PRO 26 can be bus powered. It is also Thunderbolt compatible if you purchase an adapter that is not included. I use an external hard drive on my Thunderbolt port so connecting the interface to the FireWire port worked well for me. After I got everything plugged-in and hooked-up, I went to the Focusrite Website, registered the unit, and downloaded the free software that came with the product. Included is Ableton Live Lite, Focusrite’s professional Midnight and Scarlett plug-in suites, Novation BassStation virtual synthesizer, and 1GB of Loopmasters sample content. You can also download the user manual and Saffire MixControl which allows flexible mixing and routing of all audio signals to the physical audio outputs. 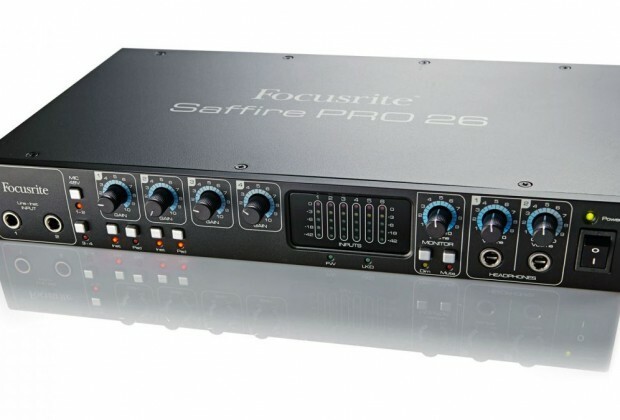 As mentioned above, the Saffire PRO 26 has four of Focusrite’s Award-winning Preamps on board. Two of the preamps have switches to use them as high-impedance instrument inputs or, if your input has too much gain there are pad switches as well. All of the preamps have 48v phantom power. 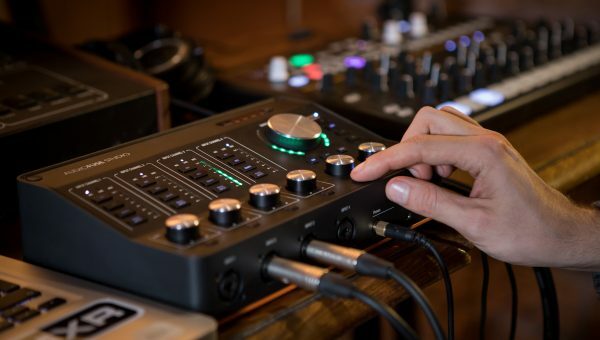 If you need more preamps, you can use the ADAT lightpipe or S/PDIF optical in to add a Focusrite Octopre Mk II to increase the amount of mic inputs to 12. For my testing I used a Shure SM58, a Neuman KM 184, and a Studio Project C3 to record acoustic guitars and vocals. I felt the tracks came out clean with little colorization. In addition to the preamps, there are two line level inputs. 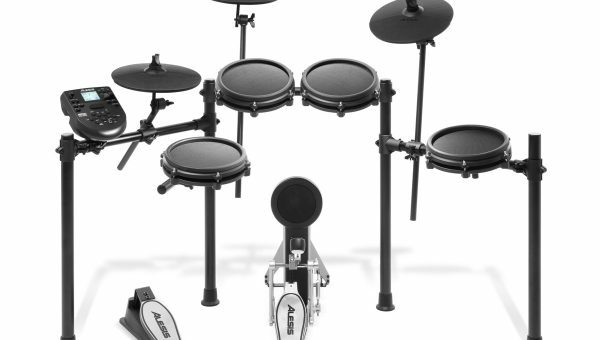 All six input levels are displayed on the front of the unit with a 5-segment LED input meter. There are 6 balanced TRS outputs on the back of the Saffire PRO 26. I plugged my monitors into 1 and 2 which can be controlled by the monitor volume knob on the front. A really nice feature is the Dim button which once pressed will reduce the monitor level by 18 dB. This helps prevent ear fatigue when listening over and over at the same volume. Two separate headphone outputs with independent level adjustments are a must-have feature for me and the Saffire PRO 26 has them, however the volume level is a bit low. The only I/O that I didn’t use was for Midi. My controllers are all USB so there was no need. I really like the Saffire PRO 26 and right now it sits on top of my list to replace the Digi 003. It matches all of my must-have features. However, since it’s not rack-mountable and the headphone volume has some limits, I’ll have to think a bit more about it. That being said, features such as input level display, direct line inputs on the front of the unit, and the Dim button actually improve my workflow. Most retailers have the Focusrite Saffire PRO 26 in stock at a price of $349 although the MSRP is $449. At that price you really can’t go wrong with an interface as feature-rich as this unit.